There’s a stretch of interstate that’s my favorite this time of year. It’s a route we take often – the one with the gentle curve and the slightest incline that leads with nature’s gradual crescendo – and just as we round the last turn, the trees explode with the changing of the seasons. Reds, yellows, and fire-orange, just screaming His name in layer after layer of colorful hues. “Don’t miss the beauty,” I tell them. There’s a fine line between encourager and boss. Lord, channel that girl. Their eyes connect with mine in the rearview mirror, and we talk about how God gives us glimpses of His beauty at just the right time. Glimpses that remind us that He’s here and He’s good and He’s the giver and sustainer of all. Crisp, fallen leaves crunch under our tires as we pull into the driveway. What was beauty just five minutes before is now a reminder of the work that has to be finished before winter comes. That, plus there are groceries to unload and a million and one things to do inside; and on a time crunch at that – our house would be filled with guests soon. No longer a captive admirer of the gentle curves and inclines of the road, I’m now a mom on a mission. 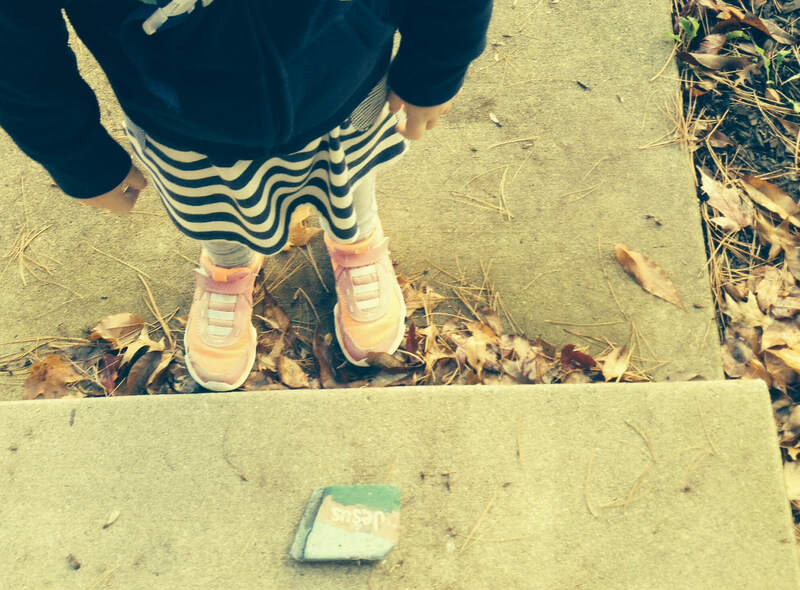 While I rehearse my to-do list in my head, that girl of mine makes her way up the front walk… sorting leaves into their fall color categories, noting the character and beauty of each along the way. That’s how imaginative six year olds do life, you know. And just five minutes off of that gratitude-filled interstate, I tell her to move that rock off to the side to where she found it before I stumble over it on my way to accomplish the urgent. “But it’s so they know, Mom,” her voice clearly frustrated, yet sincere. “So they know that we love Him.” Who? All who were set to enter through the doors of our home that night. 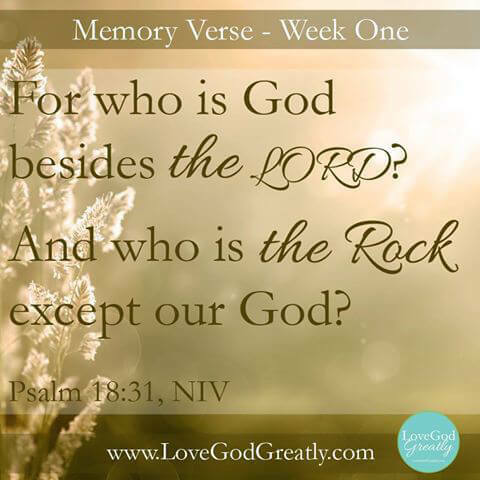 That old rock – sloppily painted with chubby hands at Vacation Bible School and weathered by years of season changes – had suddenly become the message of her heart. Smack in the middle so you couldn’t miss it: JESUS… the Source of her gratitude. While I had spiraled into worry over cooking times and floors that desperately needed attention, she had continued in worship. While my head looked down to the tasks that seemed so urgent, her eyes looked up to the provision of a Savior. And she didn’t miss the beauty. The beauty that gratitude isn’t something that we practice only when it’s comfortable. But that He’s worthy of all that we are, in every season, because He is good. The beauty that Jesus isn’t someone that we place to the side when we have better things to do. But that He’s before all things and in all things and holds us together moment by moment, because He gives great grace. The beauty that Jesus isn’t only found once a week through heavy doors in a padded pew. But that He’s found in the colors and the leaves and in the very rocks that cry out His name. Oh friend, do you see Him? Don’t miss the beauty of who Jesus is and what He’s done for you today. Then display Him front and center, so that others might come to know the true, lasting Source of Gratitude because of the Beauty that lives in you. *LET’S TALK: What beauty can you stop and thank God for today? I’d love to hear your heart in the comment section below! I will praise God today by putting flowers outside my house, in our entrance and under the flower vase I will put a note: “made by God to give you pleasure and remind you that you are loved by Him”. All who enter my house will see it. Oh my goodness, Mina, I LOVE this! Just prayed that God would use your note to open someone’s heart to His love! <3 Thanks for sharing today! Thank you for such an opportunity. I look forward to see how God ministry to my heart and mind as the days and week go back. Truly excited about the goodness of the lord. I am so grateful for what is in store. Just a perfect reminder for all of us to do as Thanksgiving Day arrives! 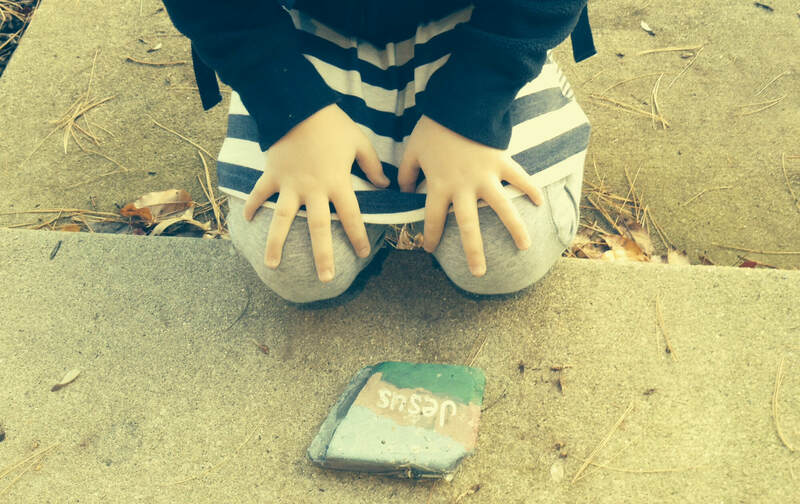 And, what if we take a reminder like this and leave it behind on someone’s porch, etc for them to find after we leave. What a lasting impression of God we could be! Whitney, please tell that precious child of yours “thank you” for this awesome reminder to not miss the beauty and to make sure they know!!! Thank you for this devotional. The Weekly Challenge – 1.) ugh…I get up at 5-5:30 a.m. anyway, but God will lead me as to what to do! 2.) I praise God for helping us this last weekend. He provided for us in a marvelous way! 3.) I have prayed that God will give me the opportunity to tell of His marvelous works at work. I know He will and I will report what happens! I always love hearing from you! You do what works best for your schedule… God knows, and it’s evident that you’re already intentionally carving out sweet time with Him. 🙂 Praise Him for His provision, and I will pray for open doors at work. Oh, I would love for you to update as He works! Dear Whitney – Thank you! – I appreciate your kind words. Yes – I am getting up that early for my quiet time with God, but I will focus more on being thankful during that time. I am doing a study on the word “humble” in the Bible and I feel as though this fits with it like a hand in a glove! I feel your pain, Debbie! So grateful our loving Heavenly Father doesn’t have to set His clock to remind Him to pray for me, think of His plans for me and find time to answer my prayers. Yes, I can do this! And you can too. Dear Sheila – What a beautiful thought! God doesn’t have to set His watch to pray for me! Just the fact that He is praying for me is overwhelming, but the fact that I am ever on His mind is so comforting. TYSM! A Supervisor (not mine, though) had been absent Monday (11-10-14). She sits by me, so I ask her how she was. She stated that she thought she had strep throat and went to a walk-in clinic. She told them all she was allergic to and they gave her a sample medication to take right away to help ease the pain until she could get the prescription filled. You guess it…her throat started swelling on the way to the pharmacy! She then drove herself to the ER and they said she was close to death! I listened to this and then said…”God was with you and watching over you!” She stared at me and then blinked…and I felt a split second “Hallelujah Cha Ching” moment! She didn’t respond, but I knew she received this and needed to hear that! Don’t miss the beauty! Tell of His marvelous works! I praise God for the beauty of these cool, crisp, bright, autumn days in Ohio. The beauty of a mound of laundry because it means that i have a beautiful family of six for whom I have the privilege of doing this laundry. I know one day this mound will be much, much smaller. The beauty of my Lord and Savior and very best friend, Jesus! Your sweet words blessed me this morning… YES to each one (you got me on the laundry!). Thank you for helping me to look for even more ways to praise God in the routine today. who would have thought to see the gratitude of the pile of laundry? I will never look at it the same way again ~ thank you for opening my eyes to a daily routine of thankfullness! The No-good, Horrible, Perfect Day! I started the new Love God Greatly Bible Study today. Today’s Scripture brought back such a wonderful memory for me. It was a Fall day, about a month after our youngest child went home to be with the Lord and our oldest child left for college. I was driving to Rollerama with our other children, hoping that there wouldn’t be anyone there that I knew. Sometimes it was nice to go to a place where no one looked at you with sympathy or concern. I wanted a day to just watch my children play and not have to talk to well- meaning people about how we were doing. On the way there our van radio broke. That may not seem like a big deal, but to me it was. The only way I could get by without sobbing while I was driving was by listening to worship music. So, I began complaining to God about how this was the last straw, when I heard a tiny voice in the back seat. My little Leah, who was 4 years old, was singing a song. It went something like, “Jesus, Thank you for the stop sign. Jesus thank you for that building, Jesus thank you for….everything we passed, she sang to Jesus and thanked Him. If my radio hadn’t broken that day, I never would have heard my Leah, singing thanks to the Lord! When we got to Rollerama, it was empty. There was just one other mom there with several kids, so I was pretty excited to just watch my children play and not have to talk to anyone about Joseph. They were the words I really needed to hear from God. It wasn’t a long conversation, and it was one I avoided but it was such a blessing. That would have been a perfect day…hearing Leah sing and getting a word from God, but God is abounding in steadfast love, so my day didn’t end there. When I got home, I was in the kitchen making dinner, when Leah came running inside. Her eyes lit up as she excitedly told me the news, “Mommy, come and see what God made me.” She grabbed my hand and led me out the front door. What I say looked like a painting. The sky was beautiful. It was orange, red, pink and purple. It really looked like a child’s painting. Leah simply said, “I sang to Jesus all day, so He painted the sky for me.” Then she ran off to play. “Thank you Jesus” was all my heart could feel. The next day I had a friend ask me, if I had seen the sunset yesterday, because it looked like a painting! So, my prayer for all of you today is that you will sing to Jesus and open your eyes to what He has done! thanks for sharing your heart. God loves you every minute of the day. You are brave and beautiful, and you’ve caused me to see Jesus in a deeper way this morning. Thank you for sharing such a tender story – one of hope, redemption, and the provision of our great God. And thank you, God, for giving us children with eyes to see. Wow! This made me cry. What a blessing you are to those who have read this little excerpt from your life. Thank you for having the courage to share this story. I know God will continue to bless you. John 14:27 has been a comfort to me since my Daddy died in 2006. God gave me that verse. I know it’s much different to lose a child opposed to losing a Father but I am grateful I will see my Dad in Heaven one day, just like I’m sure you will see your Joseph. I have a Joseph so it ministered to my heart too. I will say a prayer for God to comfort you now. I’m so glad you found comfort in the blessings God sent you that day and thank you for sharing with us here. I read your comment several times so I could fully soak in its impact. What a precious little girl who gives you joy for the moment and hope for the future amidst the pain in your heart! God did place all of these things in your pathway for He knew you needed each one…what an awesome God! Praise Him in the storm for He cares for you. I will be praying for comfort for you, Kim. Oh w.o.w.! praise God from Whom all blessings flow! That was a Spotlight of Joy in the midst of your darkness! i overslept – been doing that a little more lately – but resolved to sit down to read the post – got to the end and my heart was pricked, because it knew it was recognizing the verse. and i did recognize it – it was the one we read in the 1st grade SS class yesterday! God is so awesome. thank you Lord for the quiet of the morning, of the breath that i can take, of the ability to go in to work, and of the beautiful sun coming up over the trees and housetops. oh yes – i am also an Ohio girl! I am so glad that you made your way here this morning! Isn’t it amazing that His Word can give us such perspective and encouragement?! Yes, thank you Lord for all of these things. I thank God for every sunrise and sunset. I thank him for my beautiful kids and wonderful husband. I am so thankful for this lesson this morning! I woke up stressed about all the task I had at hand and I almost let Sanan rob me of my blessings! I have asked God to restore a revival in my heart and to fill me with his holy spirit and power to be all that he has intended for me to be! Praise to to God! May you all have a blessed and beautiful day!!! Praise God, Pamala! I love the words “restore a revival”… such a powerful thing to pray! Blessed to hear from you today. This is the generation of them that seek him, that seek thy face, O Jacob. Selah. Lift up your heads, O ye gates; and be ye lift up ye everlasting doors; and the King of glory shall come in. This Psalm makes me think o a classical piece of music with a triumphant crescendo. God laid this Psalm on my heart nearly 20 years ago. I think it embodies what Love God Greatly means to me. Don’t just let God into part o your heart open it fully, open it wide. The King of glory will come in. I have been so encouraged by doing firstly the study of Esther and now this one. I am grateful to God that you have this desire to encourage women to read God’s word. I am also grateful to read how other women are living for God, each o them in there own special way. What an amazing God we have. He is truly able to meet each of our peculiar individual needs each moment of each day. Hallelujah. Oh, how I ADORE these words of yours: “Don’t just let God into part of your heart open it fully, open it wide. The King of glory will come in.” You have inspired me to pray this today… that I would allow God full access and control of every part of me, so that I can love God greatly with all that I am. King of glory, you are welcome here! Thank you, sister, for your sweet encouragement today! Mairi ~ what a beautiful name! Almost as beautiful as the message that you shared. Yes, I will open up my heart! I too have been so blessed since early 2014 when I found these studies while rambling online. Was it an accident – no, God had it planned perfectly! And I praise Him for His love, mercy and wisdom that I know pours over me everyday. Good morning ladies. I am so thankful God led me to this site. I had started last Thanksgiving to send text daily to close friends and family and challenge them to find one thing each day to share that they were thankful for. Well, our busy lives eventually got the better of us. But most of us lasted until April. Not a great accomplishment but a great start. I am going to get back into this habit. Looking back I find that each day has a gift of some kind from God. We just have to open our eyes to His ways and not our own. What a great idea… an AMAZING start, and something that we all could benefit from!! Thanks for sharing that! Ek loof en prys my GOD vir antwoord op my gebed vanoggend. Ek prys die Here dat hy my gebede verhoor. “I praise my God to answer my prayer this morning . I praise God that he answered my prayers. Amen, sister! Thanks for sharing your heart with us today!! I think the beauty I can thank God for, is family . He made us to love each other. Yesterdday my sister in law went to dinner with the whole family. She has stage 4 uterine cancer and is receiving an aggressive chemotherapy treatment , which has been taking a lot out of her especially her appetite . It was a blessing to see the whole family together smiling and talking with her. She seemed tired, but still smiled. She didn’t do much talking , but sat there and look at everyone around her. I believe God uses us to encourage one another . She receives a lot of encouragement and love from her family . I see so much beauty in my family , during times if pain , and disappoints, God gives us each other to love and support each other , and to me I see so much beauty in that . Will you please pray for my sister in law Sara? Thank you. Today I woke up thinking of all the things that are on my mind , from work , to school, to my husband looking for a new job … Then I stopped myself , and thought I have a bible study to dig in to. ❤️Thank you LGG team for providing these resources . It means a lot ! God Bless you all . Thank you for sharing your touching story today. I am so thankful for the love and encouragement that is so evident in your family, and for the selfless ways you have poured into your sister-in-law throughout this hard, hard journey. I have prayed for Sara today, and will continue. So proud of you for getting in the Word today! You jumped into a wonderful study of God’s love for us and our gratitude due Him. Did you share the study with your sweet SIL Sara? She may love to participate and praise God in the midst of her storm! I will be praying for her. As usual, you all manage to be encouraging, uplifting, challenging, and convicting all in one devotional post. I am so guilty of rushing through moments of motherhood. Though I purpose to slow down and enjoy my children, I would have rushed right past that rock and missed the moment. Your daughter sounds so much like my own. Since she was very small, it has always seemed like she had this special love and understanding of who Jesus is, something I hope she never loses. As her mother, I pray for that. I pray that she has the tightest bond with the Lord, that God is part of who she is, the very breath she breathes, and that she truly KNOWS Him, but then I turn around and push the Jesus moments away because I am too busy to notice that she is worshiping. She is loving God when I am running, and I would be better served to just slow down or even stop and to notice and soak up some of that same kind of devotion. Thank you for your words. They have me looking forward to the next post. Your ministry is so appreciated. Right there with you, sweet friend. As I pray for me, I’ll pray for you… that we will stop long enough to soak in those incredible Jesus moments with our kids. Honestly everything else can wait, but oh, those precious moments can point them to a greater devotion to our Savior!! So, so thankful for your encouragement and transparency today. I thank my Father for Jesus, for all He accomplished for us on the cross, that He hears my prayers and is always with me to love and guide me. I am blessed, redeemed and made whole in Him! Excited to see your blog and be part of it. Thank you!!! Blessed, redeemed, made whole in Him!! Thank you, Joyce for this beautiful reminder today!! Ah, I am the same way!! I SO need discipline in my life to make Bible study happen. Grateful to be studying with you this week! Loving and seeing God’s beauty in our busyness, thank you for the reminder. A reminder that I need daily as well! this was so encouraging this morning, exactly what I needed to hear. The beauty I can thank God for is the health of my children and their love to learn and grow. Hmm… exactly what I needed to hear too, Leslie. 🙂 So glad you’re here! 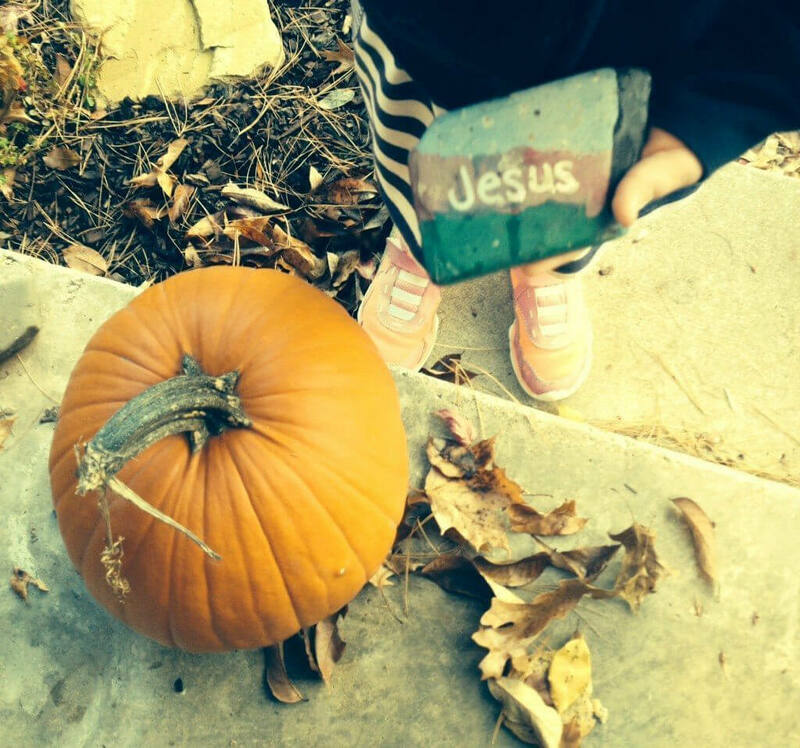 I like the idea of the colored rock with Jesus’s name on it. I am so stealing that idea and putting one in my garden. I look forward to the Bible studies. We are going to do this one as a family. Ah, love it, Amy!! And so excited that you are studying with your family! Wow, this post caught my attention so quickly. Thinking about beauty outside made me begin to picture it in my head and then seeing the rock, I literally gasped and smiled because that is the source of gratitude and beauty. I feel like I’m echoing this post but it was words that spoke loud and clear. Today I stop and thank God for constantly reminding me that I am not alone when things get too stressful with school and waking me up early to do homework but also for quiet time. That crazy rock has caused me to do the same. 🙂 I adore your tender heart through your words here. Thanks for sharing today! I am thankful for Gods grace in the hardest of times. Living with chronic illness daily can sometimes rob you of seeing the beauty in the pain, but time and time again, God shows up in miraculous ways if I am willing to look for them. I am thankful for His presence, in my loneliest days, his comfort when I am heart broken, and his love which is everlasting. God sees the big picture and although I may not understand his ways at times, I do understand that He is good and that is enough for me!! I am so sorry to hear of your pain, but oh, the wisdom and depth of your trust in God… what an encouragement to my heart this morning! Praying for you today – that you will constantly be reminded of God’s presence, comfort and great love even on the hardest days. I am thankful for you today. Beauty…. Yes it is beautiful outside. We are blessed to live in front of a forest preserve…in Florida no less. But right now, when I think of beauty, I think of our youngest daughter. She was estranged from us for almost four years. She is beautiful inside and out. In January she asked to return home. Of course! She now recognizes God as her source of strength. She is back in school. On Friday she asked is we could help plan her wedding!! He is such a sweet young man! Beauty: our daughter, Melissa! I love your perspective here, and I thank God for the healing that has taken place in you and your daughter’s lives!! What a beautiful sight to see a child come home. I am rejoicing with you today, friend! As I sit outside on my farmers porch I enjoy the beauty of the fall leaves. Such magnificent colors of gold, orange, and red. I enjoy the warmth of the sun and a slight fall breeze as I look at my Gratitude study and appreciate how much our quiet country home blesses me. The quiet atmosphere allows me to dwell and sometimes linger in Gods presence. It is here where I find my peace and hope in Christ. Most days its uninterrupted. Today my family is all here and my time has been interrupted by questions from my youngest son. Despite this I reminded myself I am grateful for All God has done for me my dreams of a country home and a family answered by an awesome and faithful God. Sounds amazing, Diane (I can close my eyes and almost picture it!)! Thanks for sharing!! What a beautiful reminder to take time out of our hectic lives to remember our Creator, his power, love, creativity, beauty, mercy, grace, and compassion. All too often I keep my head down, worried about things on earth. I neglect to look toward the source of my help. By taking time to look up and remember the beauty, I remember my Lord and that is powerful! Thank you. Dear Monica, that is indeed so true ! How I loved the visual – head down…we are looking at the earth (the world) – head up…we are looking toward the sky (heaven)! Gratitude is something I sometimes overlook here in Hawaii. I don’t live near the beaches, but I do live between mountains. On a beautiful clear day, I can see every crevices that the hand of God carved. And when I drive to work the beautiful Haleakala reflects God’s beauty of the island. Wow! I’m sure that WOW is right!!! Amazing to think that the hand that carved those crevices belongs to a God who deeply loves and cares for us. Thanks for studying with us this session! May God richly bless you for starting this study. I would like to praise God for the beauty of His creation, for the changing seasons, for the breath of life, for beautifully choosing us out of a billion people, adopting us as His own children and for His beautiful plan for our lives. Sweet Aruna, a big YES to all of your praises!!! I’m so thankful that you’re studying with us!! thank you for this my husband and I went to lourdes of grotto in md yesterday and it was so..beautiful. So glad you had that time together, Lisa! Many years ago I planted some Texas sage and White Mist bushes outside my kitchen window. Over the years the White Mist has woven its branches into the sage, using it as a trellis. So instead of being just a couple of feet tall, it’s grown to almost 5 feet in some places. Two weeks ago, the White Mist burst into bloom, with a scent so sweet and fragrant. When the breeze stirs the blooms, I can smell it all the way around the house and it attracts hundreds of butterflies and bees. Although the blooms are beginning to fade, a few Queen butterflies and a handful of bees are still enjoying the last of the sweet nectar the blooms provide before the cold weather comes. I’m so blessed to be surrounded by the beauty of God’s creation. It brings me peace when the days are hectic and joy just to be in it. Oh Laura, your description sounds beautiful! Thankful for that same peace today! Welcome, Jolene!!! 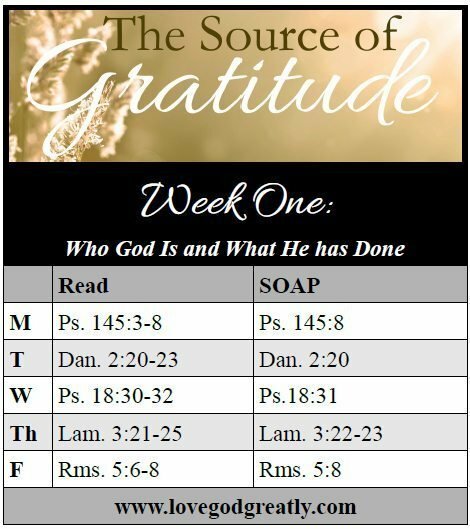 SOAP is a Bible study method that we use here at LGG. This post helps explain it! 🙂 So glad you’re here! Thank you so much for bringing this wonderful study to us! The Lord had me all prepared and open to receive your teaching…. He’s been working on me! I am truly blessed by this study and so very touched and moved by the fact that Every comment was Answered!!! God Bless You! I love that you mentioned that the Lord has prepared and opened your heart… how wonderful that you are ready to receive all that HE has for you! So thrilled that you’re here with us! I looked out my window and saw an incredible sunset and ran outside to capture some of it’s beauty. When I returned, I sat down at my computer to read the new Love God Greatly post for today! What joy to see and read what I was just experiencing. That God indeed shows us His beauty in so many moments. I was blessed by His presence, as I looked up!!!!! Oh Charlene, I love how God timed that (and that you stopped what you were doing and ran outside… I need to do more of that!)! Thanks for sharing! I can stop and thank God for all the wonderful seasons that go on here in MI. Hi Faith! I’m in Indiana, so I’m enjoying the similar seasons with you. 🙂 So glad you’re studying with us! I am fellow Hoosier transplanted in Tennessee for the last 8 years! I was born, raised, married and then raised my family in Indiana! Look up at see the beauty so much to thank Him for the beautiful fall leaves red yellow and oranges the beautiful sunset pink and yellow and blues and the softness in my horses beautiful eyes it’s almost as of I can see God looking at me through her .. Seeing God through His beautiful creations it’s amazing and I am truly grateful for the love He shows through the details ! I’m so glad you included your horse in your description… I can picture those soft, beautiful eyes now. So sweet. Thanks for sharing your heart! I didn’t have time to read all the comments so please excuse this question if it has already been asked; Is this study going to be on the You Version Bible? I hope it is and I have friends who are hoping that as well. We have only been able to find last years ‘Thanksgiving’ study. I’m so sorry, but this particular study is not on YouVersion. We are thrilled to say that we will be offering YouVersion again at the beginning of the year, but if YouVersion is the better option for you right now, you are welcome to use last year’s Thanksgiving study (which some are doing… we love that study too! :)). Thanks for the great question! I am so thankful to a forgiving, faithful God that I get to serve. He provided with a beautiful day to get wood split before the lovely cold front moved in. He is showing my husband his great love and faithfulness while he, my husband, is over 200 miles away from us in rehab. God is not only helping him, but providing for my needs as well. I have so much love and thankfulness to God. I’m so humbled by your heart of thanksgiving even during this challenging time with your husband away. Your words are inspiring and such an encouragement to me! I have prayed for you and your husband today. Praise God for how He provides!!! Thank you for sharing your heart with us! Aaahhh… Casie, I’m SO proud of you!!!! There IS amazing beauty in those quiet moments!!! May I share your testimony on our main Facebook page? 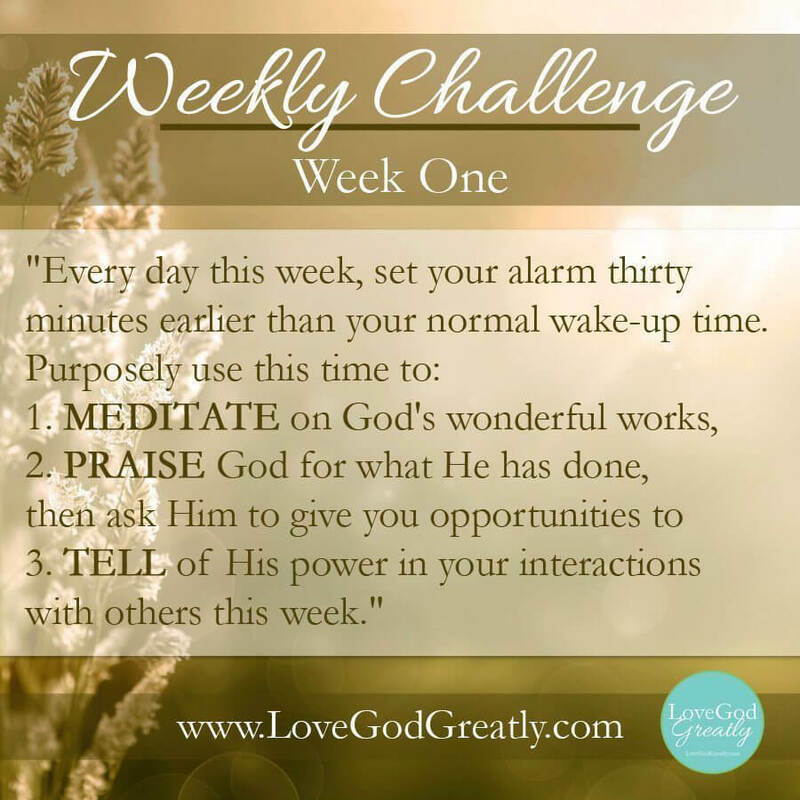 I know it would be a great encouragement to those who are really “challenged” by this week’s challenge! 🙂 Thanks so much for blessing me today! Whitney – I’m glad you went ahead and used my post. 🙂 I hadn’t been able to check back all day. Looking forward to my early morning alarm… Thank you! Ooohhh… I’m so glad that was ok! 🙂 I loved it because it was so real, yet so encouraging… and I know it will resonate with everyone who is thinking of just skipping out of the challenge this week. 🙂 Thank you, friend! God has given me the most beautiful family. Help me Oh Lord to be everything you created me to be for them. Iam so thankful for thrm. I love this, Tabatha: “Help me to be everything you created me to be for them.” Simply beautiful!! Thanks for sharing here! I am grateful for my prayer walks in the forest preserve. But especially yesterday as a deer was standing right in the middle of the pavement looking at my daughter & I then it scampered off to the side in the brush as we walked forward. Every time I looked his direction he would just stand & stare me down as if it was God almighty speaking to me with those eyes saying look. Then it would run & hop with such a joy like a playful child & i felt God speaking to my heart that he wants me to be less serious & truly enjoy all he has given to me. Thank you for that reminder Lord. His sweet reminders of joy are always such a blessing. Thank you for sharing this with us!